I think I have shared before that owls live with us…they don’t live in the house with us but in the decades old trees that shade our decades old house. Several years ago they graced us with their presence and raised three owlets that Spring. Then they moved on to the hunting grounds, and found other places to raise other hatches, and we did not see them…until this Spring. It started with the familiar hoot-hooting, and then the sightings as they sat 25 feet above us in the naked part of the branches. And late one afternoon we saw THEM–the babies–two of them…in the tree branching over the house. We noticed that Papa Owl became a little more hostile, and we learned that he had a different hoot-hoot just before he dive-bombed the cat. The cat caught on quickly and he hung closer to The Farmer when they were out tending the gardens. The last Friday in May, Elizabeth and I were out in the gardens working in the morning. Elizabeth went into the house for a water break and noticed an owl hanging upside down in the Ash tree. She hollered at me that an owl was hanging upside down, and it looked like he was struggling. She thought it was an adult, but when I got there to look I realized it was much too fuzzy and was one of the babies. I also spotted Momma Owl a branch away, watching over him…and ME. Not knowing whether this was an owl training exercise or something to be alarmed about, I moseyed into the house and googled ‘owls hanging upside down’. After reading that owls do not hang upside down…but bats do, I decided maybe I should be concerned. I searched the Internet further and found nothing about this hanging upside down being normal…though I did find that adult owls get hostile when they have owlets and they are particularly nasty to the domestic cat…no surprise there. Things moved quickly–following The Bird Lady’s directions I rounded up the closest thing to a leather coat and helmet (my suede cloth coat with a huge, thick hood), and called The Farmer to bring the loader over, and sent Elizabeth scrambling to find the ladder. I had no idea how I was going to balance that ladder on the teeth of the loader, or even if it was high enough, and what I was exactly going to do once I got up there. I just knew I needed to do SOMETHING! You can’t ignore a baby owl hanging upside down! While The Farmer was ‘reasoning’ with me from the seat of the grumbling diesel pickup (or was that the grumbling farmer? ), the owl loosened himself and dropped, opening his huge wings just at the right time and breaking his fall. He landed on the ground in a still heap. I had taken the precaution of putting the little Boston Terrier in the house, and Ty (the yellow tiger) was in Elizabeth’s room, but I had not anticipated that the old arthritic dog, Sydney, would spring to action when she saw the owl tumbling to the ground. She started with a burst of energy, and I lunged forward with my own burst of energy, grabbing a wad of hair on the back of her neck. 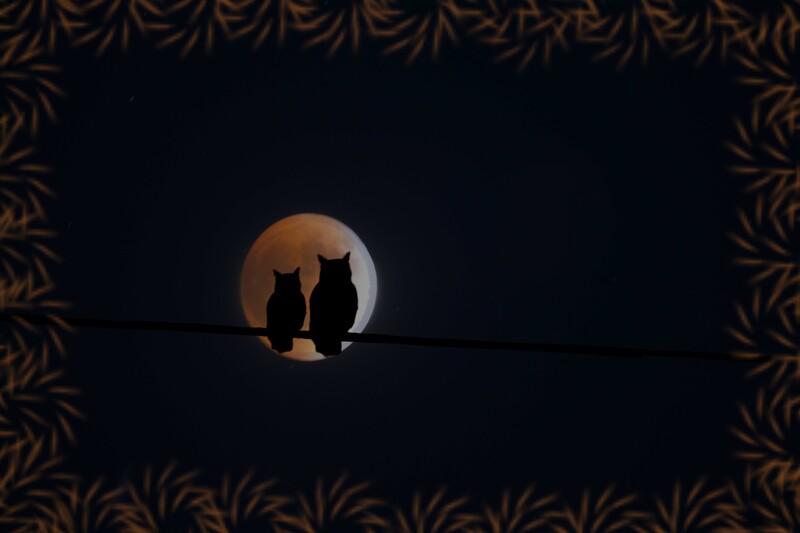 As I was struggling with Syd, and Momma Owl was turning her eye toward me, we discovered that Papa Owl was present…He began his nervous hooting ending with the special hoot that he makes right before he DIVE BOMBS! My adrenaline kicked in, and before Syd had any chance of escape, she was shoved in the garage with Superwoman (ME) excitedly shaking her hands as The Farmer closed up the garage. When the dog had started her charge, the heap of Owl had twisted to his feet, puffed up his wings, and was clacking his beak! Now he was calmed down and limping toward the canal. The Farmer had gone back to work, Elizabeth was headed into town on farm business, and I returned to tending the garden…and watching the baby and redirecting traffic. The Bird Lady was still a ways out. I watched as the owlet tried to climb the tree–using his beak and talons (like a parrot) and hugging the tree with his expansive wings–then he fell to the ground, rested, righted himself, and hobbled across the lawn to settle under the honeysuckle bush below our bedroom window. The Bird Lady pulled into the yard. Across the front of her pick-up in big letters was spelled out “The Bird Lady’. Within 5 minutes she had scooped the bird up in her net, and we found ourselves sitting around the diningroom table…Owlet laying on his back in her lap, his feet neatly secured in her left hand and she talking on the cell phone with her right. He mechanically turned his head looking at me with his bright round yellow eyes…me, then her, then me…then a blink, then all over again. Nothing else moved a feather. THOSE EYES!! After The Bird Lady finished her call, she assessed his condition: he was about 4 weeks old, considered a branchling. (This was good–Mom and Dad would bring him food. If he were a nestling, they would take the food to the nest and he would starve to death.) Nothing broke, leg looked a little strained, but should heal okay. He still had his blood feathers and was not ready to fly–too heavy, feathers not fully developed. She was surprised to see he was so young–this was late in the season for owlets, most owls and their offspring have moved to the hunting grounds. We found the ladder and hoisted him up to the lowest branch of the decades old evergreen. Dad Owl hoot-hooted, as though saying thank you, and Momma watched. We checked on the little fuzzy guy all evening–he seemed fine, moved from several branches, and the next morning he was gone. We assumed he had moved up to be closer to Dad or maybe to find his nest…we will never know. We had all the reasons in the world to think this was going to end well. But, the following week we found a stiff fuzzy body of a branchling Great Horned Owl under the decades old evergreen—not the tree we had left our owl in, but the tree our owl had tried to climb. This was the morning after another set of night-time 35-45 mph winds. Whether this owl was our owl and had again gotten hung up, or whether this owl died in a fall caused by the wind, or whether this owl was our owl and had succumbed to internal injuries from the first fall, we will never know. The owls were silent the rest of the week—both babies must be gone, we reasoned, and the owls have left, too. We continued to tend the garden, and the swallows continued to build their nests, and the red headed finches nested in the decades old evergreens. Wednesday evening of last week The Farmer motioned to me from the front yard…I came quietly to his side and he pointed up into the ancient evergreen. There perched on the fronds 25 feet above was a regal Great Horned owl with underdeveloped ear tufts…and off to its right sat Momma—watching in her knowing way. We don’t know if this is our hanging upside down friend, or his sibling. I like to think it is the sister of our friend—but it really doesn’t matter. We celebrate that the Owls will have one nestling to take to the hunting grounds down by the river this week…the owlet must be 7 weeks old and can fly on its own. Au revoir, my friends…come again next Spring. It was a clear fall day…lots of sunshine…lots of bright puffy clouds…and NO WIND. That was the day we first set about putting the cover on the 96-foot-long hoop skeleton the Farmer had constructed the week before. Two hours into the project–you never know how long these things’ll take–the weather took a turn and I found myself hanging on for dear life, knuckles red, fingers numb, and all my body weight prone to cover more area in an attempt to make my mass heavier; I was given the impossible task of ‘holding down the cover’ that we had tossed over the frame, but that was not completely stretched yet, and definately not securely anchored! Nature can be a force to be reckoned with! Needless to say, the hoops did not get a good start with their covering. Before we finally called it quits on day one, the cover had a tear that doomed the skin forever–the flaw that led to its demise. Then the 70 mph winds of Thanksgiving ‘curled’ the roll bars like licorice, tattered the cover on the west side, and shredded it on the east side. The end-panel zippers on the north were blown-out–all three of them. (Wind damage is not a warranty issue…) We spent the rest of the winter watching the shredded plastic whip in the wind like a weather-vane, telling us the direction of the prevailing gale–and its intensity! Years ago, when it was just The Farmer and me, we both worked full time jobs away from the home: Me—in an insurance office, and He at the city airport. I got in a habit of making quiche…a lot of quiche—It was FAST. I did not make the dough, but took pieces of bread and rolled them thin and layered them on the bottom of a pie pan. Then I mixed up the eggs and whatever else was needed for the quiche, and poured them over whatever I was using for the filling…often cooked broccoli and chopped meat of some kind, but mostly left-overs from yesterday’s meal stored in containers in the fridge. One particular day I was late getting out of work—I don’t remember it being a particularly nice day, I remember being exhausted and probably a little cross. I rushed home, the whole time going over in my head what left-overs were in the fridge. When I got home and opened the fridge, which was a little bare (must have been the last week of the month—we got paid on the first), I was surprised to find the customary storage container with the sour cream bottom and cottage cheese lid on the top shelf smiling at me—don’t remember putting that in the fridge, I thought to myself. I cheered up a bit—comforted by the thought that dinner was going to be quick and painless! I quickly rolled out the bread, greased the pan, and layered the bread on the bottom and up the sides a bit, then mixed up the egg mixture. I heard The Farmer pull into the driveway as I confidently dumped the left-overs into the pie pan, and quickly covered them with the liquid egg-stuff, sprinkled a little paprika on top, and popped it into the pre-heated oven. Da-da—DONE! Twenty minutes later we were seated at the small table in our kitchen, exchanging pleasantries of the day, and chomping down our salad…I’m sure I shared my horrid day in complete and boring detail. The Farmer listened patiently with a look of total understanding and sympathy, but who knows what he was really thinking about— The oven timer beeped and it was time to serve the quiche. I cut the quiche, it was a little tough so I got a sharper knife. Since this was our main meal, The Farmer got a piece the size of Texas. I turned my back to put the quiche on the counter and heard a mild grunt. When I turned around again, there sat The Farmer—not one word did he say, but hanging from his mouth was a carrot top and green strands. He was digging around in the quiche with his fork, and uncovered a hunk of gristle and fatty meat scraps, another carrot top, and the end of an onion. My mind started racing—where in the heck did that carton of left-overs come from? Come to think of it, I didn’t remember putting anything in the fridge last night—–last night was a left-over-meal and you only recycle left-overs ONCE. When the mystery was solved, we discovered that The Farmer had seen the container on the counter after I had cleaned up the kitchen. Thinking it was my usual left-overs for the next meal, he stuck them in the fridge. Instead of human-food left-overs, we had doggy-food-slop left-overs—While cooking, I often kept a container handy and would put eatables in it for Suzie, our black Lab, or scraps for the garbage. Something good comes from everything. I discovered that night that The Farmer DOES NOT LIKE QUICHE. He never liked quiche. He will never like quiche. He had never complained or said a thing when I fixed quiche, which was about twice a week—at that time. You know…they say that REAL men don’t eat quiche. The Farmer is a REAL man so it is probably in his DNA to not like quiche. Not even doggy quiche. We don’t eat quiche–ANY MORE. The Farmer has always loved hot sauce. I think it is in his DNA from his Grandma Mary Magdalena Mondragon. His mom, Mary’s daughter, loved hot sauce, too. Growing up, the Craft’s always had hot sauce in the fridge, at the table, on the counter—–they ate it with the meal, as a meal with chips, on eggs, in a sandwich with mayo, and lots of other creative ways. Early on in our life together, while I was still learning to cook, The Farmer would eat anything I served—-as long as I had hot sauce and he could pile it on. I think, in retrospect, that was how he tolerated the learning curve while I developed my culinary skills—-the less palatable the dish, the more hot sauce. One day at Safeway, our local grocery store at the time, they were running a special on peppers. They had at least six varieties: red chili peppers, jalapeno peppers, Anaheim peppers, Poblano peppers, cherry peppers, and these adorable little orange peppers that looked like a Chinese lantern. I bought a little of each, excited about adding them to the meals—but especially those sweet looking lanterns. That night we were having stir-fry. I chopped four of the lanterns and put them aside. Then I chopped all the veggies, and stir-fried the whole batch for the family. I took The Farmer’s portion out, and stirred it up with the hot peppers, separate from the rest of the family. He wasn’t fond of stir-fry, but he loved hot peppers. At that time we were a family of six-—the older two were girls and the younger two were boys; Kaleb was the baby at two years old. I was stirring up The Farmer’s portion as the rest seated themselves in preparation of the meal. It was the normal hum of a full family—-scrapping chairs and bustling kids bantering over who is sitting where and why. I fixed each one a plate, we passed them around, and then I placed the salad in the middle of the table. Everyone dipped their share of salad from the big bowl and I scooped out a small handful and put it in Kaleb’s bowl with a little Ranch dressing. I was rather proud of The Farmer’s dish with those beautiful lanterns, all four of them, artistically sliced throughout and cooked to perfection! The Farmer blessed the meal, and we dug in. Then began the ‘ripple effect’—The Farmer, who had taken a large bite including the pretty peppers, was speechless and his forehead immediately beaded up in sweat; the baby cried out and continued to cry as he held his tongue; and I rubbed my eye with my Habanero hand. Not only were The Farmer, the baby, and the Wife in pain, so was everyone else at the table–to a lesser degree as they only had the pepper juice from the knife blade. So we ALL experienced Habanero—in varying degrees—that night. I’m happy to report, nothing was wasted…The Farmer’s stir fry made 6 quarts of hot sauce, and even then we had to dilute it! Thank you for a great wildlife story. Thank you for sharing. That is so the life of a Farmer and his family. I remember it well with great fondness.